Mickaël Bouges in his open chai Faverolles-sur-Cher, Touraine (Loire) Mikaël Bouges is a winegrower with 4 generations behind him in the winegrowing trade along the Cher river in the Loire. He founded his own winery in 2005 after working with his father's Domaine de la Puannerie since 1999. When his father decided to retire in 2005 Mikaël had the choice between buying back his father's 16-hectare domaine or set up a separate, smaller estate for a slower beginning. His father was selling both to the négoce and to private customers, but the larger surface would have pushed Mickaël to hire, which he did not want to, at least in the early years, so he opted for a separate domaine, managing 5,5 hectares, some being rents. Over the years he grew up and he now farms 8 hectares, adding parcels with a different terroir or expression. I understand that it is was not that difficult to find available vineyards in this area until 2005, either to rent or to buy, but he wanted to be selective in his choice. In 2005 the growers were offered generous grubbing-up subsidies (prime d'arrachage in French) by the French administration and as usual elsewhere in France, these are often the good parcels (small, old and located in uneasy corners) that were uprooted, which means that from 2005 it was tricky for him to find interesting parcels to farm. It seems to me that the government and agriculture bureaucracy (Agrimer) never learn and that the taxpayer's money supposed to raise the wine prices by reducing the vineyard surface leads a counterproductive result, as quality parcels are being erased first, instead of the high-yield/flat-land/conventional vineyards. The scheme is not effective at all for raising the price of bulk wine, but no one complains as growers are being offered pocket money by the EU or the French state. The terroirs under these uprooted vineyards are still there today with their minerals and soil characters but you need to replant from scratch when you could have had old vines on it without this big-government interference. MiCkaël Bouges replants little by little, 20 ares every year, so that he can spread the replanting over several years. For the facility, he found this group of cellars in the limestone with a long history of winemaking, even if only the small house along the street was used when he bought the whole thing. This house was built around 1950 and it was kind of a miniature farm with a chicken coop, rabbit hutch and pig pen, there was enen a small side building for a horse. He put down most of these structures to have a suitable room outside the cellar. He had a concrete slab poured in front of the cellars and a large roof erected over it so that he had a secure chai for the pressing and the early fermentations. Vats, casks near the cellar doors Asked if he farms his vineyard a different way compared to his father, Mikaël says that his father was amready farming organic, the domaine was converted in 2002 and sold as such (it was reverted to conventional farming by the new owner since). That's why he has experience in the orrganic farming, but he says that he learns more every year, also through contacts with his neighbors like Noëlla Morantin and others. On the winemaking side His father always kept working like before the additives era, no added yeast or other things, and Mikaël learnt to work this way. He was already eschewing additives, the only thing he added was SO2 during the élevage of the wines, something Mikaël doesn't do in his own domaine, using sulfur only for bottling. His father didn't do de-acidification either or do anything that would change the nature and character of his wines, he didn't have big yields and he managed to make wines that were balanced on these beautiful terroirs. Asked when all these additives and correction techniques landed in this particular region (Touraine, Loire), Mikaël says that for example deacidification and chaptalization came here in the 1980s', and lab yeast came in the 1990s', before that people weren't using designer yeast. He says that more reowned regions like Burgundy and Bordeaux began using added yeast before Touraine, first because they were more rich, same for herbicides, the richer the wine region the sooner thay adopted weedkillers. In Touraine where farmers were more poor and where wines were selling for much less, the traditional farming and plowing lasted until more recently among the mainstream growers. I think that's an interesting issue to address because there's a wide difference between the wine regions in the timing of the use of chemicals and correction tricks. While now the chemicals/additives are associated with lower quality and commercial wines there was a time where an upper layer of more afluent wineries opened the way with these techniques and products that were thought as bringing a dramatic improvement. Then I guess, encouraged by the same state bodies that now pay big money to uproot good terroirs, the mass of growers were taught in wine schools and by agriculture bodies to follow suit. Mikaël bought this vertical press on the right to press late-harvest grapes. He made also cider once because there was so much apples in the orchard near here, having the fermentation in a small vat and then making the élevage sur lattes (in bottles) for 3 years. This was good, he likes cider. He bought the press second-hand in Normandy where people make a lot of cider, he found it in the classifieds of a newspaper, the odd thing is that it was manufactured in Amboise in the Loire and so it sort of came back home. In one of the cellars Mikaël has several cellars opening on the cliff, unlike elsewhere in the region they're not former limestone quarries because the chalk/limestone doesn't surface on this part of the hill, the rock was not suitable for construction because it is of a mixed nature, the hard rock being very difficult to extract as contruction cinderblocks, so these cellars were meant as wine cellars from the start. Elsewhere like in this story they were quarries first (to build ordinary houses in fromnt of the quarry or the Loire chateaux kilometers away) and then when the extraction was discontinued the cavities were turned into winemaking facilities. Mikaël says that another little-know thing about the region is that the Sauvignon Blanc is a recent variety in the region (Touraine, Loire), it reall set fot here in the 1970s' and now there almost only Sauvignon as a white variety here. It was a fad penomenon inspired by the commercial need to sell wines rapidly and wines that were on the fruit and aromatic side. The Chenin on the opposite was loosing ground because it was less easy to grow and farm, plus it was less fruity and you had to wait longer for the wine to be ready for the market. You need also to have good, adapted terroirs to make a good Chenin wine while it is more lax for Sauvignon, especially that along the years the slopes were abandoned in favor of the plateaus or the plains, and it was easier to grow sauvignon on these surfaces that keep farming Chenin on slopes (the Chenin needing these draining and warmer soils to ripe). Aslked about now-almost-erased varieties like Pineau d'Aunis or Grolleau, Mikaël says that in this area there was no Pineau d'Aunis because the soil is sand and gravel, but there was lots of Menu Pineau, Chenin and Sauvignon Rose, Sauvignon Doré, there was a bit of Grolleau but not much actually. There was lots of Cabernet Franc (this is the eastern-most limit here for cab franc to ripen), Côt and Gamay, the latter being more prevalent in the vicinity of Saint-Aignan compared to Faverolles. In short, this small Touraine area of Faverolles-sur-Cher and Saint-Julien-de-Chédon was planted in the past with Chenin, Cabernet Franc and Côt. Again, this is intertesting to learn that before the wine administration and appellation bodies meddled into the ancient farming traditions, Touraine was not a uniform area regarding the varieties, there were slight differences that were dictated by the empirical realities of what grew/riped well here and there. In that time it is good to remind also that there was no wineries making wine only, these were generic family farms doing different crops, grapes being one of them and the wine being usually sold in bulk to the négociants. Mikaël has few casks right now in the cellars because yields were low on the last couple of years, he uses both 500-liter barrels (demi muids) and regular sizes. He gets rid of the casks when there's not wine inside like for example because of unusually lower yields from one year to the other, and he keeps the casks from year to year when he can the same day rack the previous vintage out and fill the empty vessel with the new wine. If yields get back to normal in 2014 he'll have to buy casks again, he usually buys them used at Joseph Drouhin in Burgundy (they're already 3- to 4-wine old when he purchases them). embedded in the rock on the right side. In these old times (a couple centuries ago) farmers hadn't the means to buy manufactured presses and there was probably no national manufacturers for these in the first place, so the presses were foremost using the existing raw material, the rock, and artisans would build a custom press adapted to the cellar dimensions. Here you can see an hydraulic system at the top of the screw but this system was not used in this cellar at the beginning : Mikaël says that this press was powered originally by a system of ropes going from the lid of the press to the crank on the right (picture on right), using the cavity on the left for the leverage effect. That's the way I understand it although I have pain fuguring exactly how it worked, but the thing is, using the precise parameters of this cellar, specialized workers could set up a powerful press using the minimum of costly machinery, the crank being probably the most expensice part and much of the rest being wood and ropes. Later, an hydraulic systemwas adapted atop the screw and the prtess kept functioning but without the need of the crank and leverage system. The bottom of the press is sculpted in the rock table (possibly repaired with cement in the mid-20th century) and the whole rock mass around probably played the role of a natural cooler for the grapes, I'm sure they were making nice wines in these conditions, especially that the vineyards were just atop the cliff at a very short distance and picked by hand (no additives, no chemicals, picked by hand and pressed under cool temperatures nearby, what else do you need ??). You can see the opening of a cavity on the left side of the press, that's where the juice would flow to setlle. From there it would be pumped into casks lined in the cellar, the cement casks in this cellar being recent additions built around 1950. This looks strangely similar to the remains of an ancient facility that I pictured in Israel a few years ago, in the Yatir forest (Hebron mountains), same square press floor carved into the rock, same vat on the side for the settling of the lees. When Mikaël bought these two sets of cellars, the ones he is using now and these ones he purchased more recently, neither was in use, the last time they were active was 50 years ago, but what he wanted was this natural temperature control of the rock, and he could just add a roof and outside with a concrete slab for an open chai inmilder temperatures. There are plenty of such cellars in the region, most being empty and unused because modern wineries prefer up to date facilities. When harvest comes Mikaël vinifies outside under the roof he had built, the horizontal press on the side with the resin vats around. When the fermentations are completed he puts the wine inside, in vats and barrels. The terroirs are vinified separately, he uses smaller vats for certain parcels. For the reds, the young vines are vinified in vats only while the older vines have an élevage in barrels. He makes roughly 10 cuvées every year, which is much for a surface of around 8 hectares split on 16 parcels (terroirs and varieties). The Côt (parcel : le Coteau) Mikaël's vineyards are over a small radius of 2 kilometers, all with a view on the city of Montrichard on the other side of the Cher river. Most of his parcels are in the area of Faverolles and the rest on Saint-Julien-de-Chédon, the last time I heard about this village being when I visited Brendan Tracey, the Californian who makes wine near Vendôme (60 km away, also in the Loire), as Brendan purchases most of his fruit from an organic grower in Saint-Julien de Chédon. Recently he took over another parcel in Saint-Julien. Asked is Faverolles is really where many artisan vignerons choose to settled down like I hears people say, Mikaël says that there is indeed a solid core of motivated winegrowers there, and one of the reasons being that the vineyard is not covering the whole area, it's rather a few parcels here and there, making easier to start with a couple of parcels and grow. There are 3 or 4 such artisan growers here which is quite a good number for a village this size. To put things in pertspective there was 250 hectares of vineyards 40 years ago and 120 remain today. We stop after a short drive on a first parcel of Côt, this one-hectare parcel is named Le Coteau, it is exposed south with a stream flowing down the slope 40 meters down the hill. He planted this parcel himself with massal selections (most of his vineyards are massal selections), following the advice of his grandmother who kew well the terroirs around here and told him that his rows had to be planted toward this stream. The parcel is bordered with a hedge of frui trees and there's no other crop in the immediate vicinity. Mikaël set up his winery in 2000 and began the conversion to organic farming in 2002, it's farmed organic since that time. He works alone for his farming tasks but his father comes to help. He trims the shoots because they were too high, sometimes it's so wild that when you harvest it's a bit too messy, so he prefers to trim them. The soil has lots of stones, it's made of alluvial deposits because the Cher river was flowing here, plus you have both limestone and silex (flintstones). With the recent rains you see this gravel made of different types of stones well. with good conditions, he says helping other people is good for the trade and there's enough room for people who want to work the right way. You can't wait for the state, the administration to help you because they only help winery startups who meet certain criteria and these criteria are only based on commercial efficiency and things that have nothing to do with real quality. The more artisan producers in the village the best it will be for potential negociations with the village administration as the village will have a growing quality image. We drove to another parcel planted with old gamay and sauvignon (half an hectare each), these are old vines he took over this year and which he is converting to organic farming. The former grower who was renting this parcel is reaching soon retirement age soon so he's dropping some of his rented surface. What he wanted here is to keep these vines alive and work with them. The soil is limestone too but not of the same nature compared with his own surface. Here again there's a nice view on the Cher valley. There are very few missing vines on this parcel, the guy who farmed this parcel was taking care of them although he was farming conventionally, he still plowed between the rows. On the whole, Mikaël says that he has not many occurences of Esca (the vine disease that takes a toll on region) on his vineyard parcels. 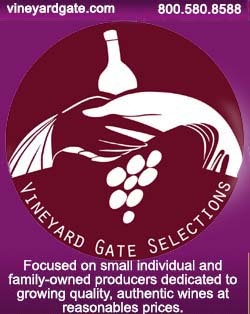 He'll sell the gamay grapes because they're not fully certified organic yet, and he'll vinify the sauvignon separately. Mikaël Bouges doesn't buy grapes, he only vinifies the grapes he farmed himself. He otherwise sells his grapes in organic conversion, waiting the full organic status to vinify them himself. Asked about horse plowing in the area, he says that the Domaine des Capriades (Pascal Potaire) users one, he's the only one here. Mikaël tried to use one with the help of someone but he stopped to, partly because the money he planned to use for the horse was spent on buying the couple of cellars next to his. On the Bellevue parcel We drove further to another parcel appropriately named Bellevue as the view over the Cher valley and Montrichard is particularly nice. The soil is very draining here it looks a bit like sand by the way. I notice that the vines are pretty low like in the rest of his surface, he wanted it this way, lowering as much as possible the vines closer to the ground. Elsewhere around growers train the vines higher. The lower training keeps the vines more compact and yield better fruits, it may be also why he has less esca cases on his vineyards, the movement of the sap upward to the upper wood being possibly a cause for this disease. When he takes over an old vineyard he tries to gradually lower its height in a way that is not too tough for the plant. The higher training was chosen by growers as an adaptation for machine harvesting but this is not good for the vine itself, which gets tired in the process of pushing the sap at an unnecessary height (some say this can contribute to the prevalence of esca). His pickers are to be warned about this lower training, as it is more difficult to bend all the time at hervest time. Turning the natural sparkling Back to the facility we tasted a few of Mikaël's 10 cuvées. He is also making natural sparkling (which we didn't taste), you can see here a few riddling tables that he keeps in one of his cellars, at the place of a cement vat of which only two sides remain. The cellar is an ideal setting for the quiet settling of lees, you can have a glimpse on a few casks above through a small opening leading to his other, parallel cellar. In some of the cellars (like the one on the video) he kept these cement vats dating from the 1950s' although he isn't using them, here he had to take them down because there was too little room. Before these vats were built, you could come and go from one cellar to the other through this vaulted passage. At the beginning when he started his winery in 2000 he made only two cuvées, La Pente de chavigny (sauvignon) and the Côt young vines, then little by little he added parcels and he makes now about 10 cuvées. He makes actually two sparklings, a pet nat (picture) and a méthode traditionelle (Champagne method), which he makes elsewhere with Pascal Potaire (Les Capriades). Mikaël doesn't do the ritual tasting of the vats or the barrels when a visitor comes, he says that in his mind only finished wines should be tasted, that's why I'll only taste from bottles. Les Couilles D'Ânes 2010 (Côt) We didn't taste this cuvée during the visit but I enjoyed this bottle several weeks ago after falling upon it a weekend in a shop near Saint-Aignan sur Cher. While I had heard about Mikaël Bouges before, it gave me a good pretext to visit him because the wine was so good. This Touraine Côt Couilles D'Anes 2010 was a great pleasure indeed, imagine a Côt with thin, civilized tannins coupled with an incredible minerality, this is it, that's why he named the cuvée Couilles D'Ânes which means donkeys balls, as the soil under this parcel is thick with round stones the size of (I guess, I never checked...) donkeys' balls. We often speak of minerality for wines but with this one you really feel like you're drinking liquid rock, that may sound repulsive but believe me, that's very enjoyable... The Côt behind this wine comes from a parcel we didn't visit, this is massal selection too of course. The back label says that the word is a popular expression for these pebble-type stones, the geological origin of which being still a mystery. This cuvée yields a small volume of bottles every year (a bit more than 1000 bottles) and Mikaël says that he doesn't advertise it, so to say, because there's not enough of it for everybody. He sells it for 15 €, a very good value I think. __ La Pente de Chavigny, Sauvignon 2013. Nice texture in the mouth. Sells for 8 € retail. The malolactic is not completed here, they're never made on the whites, but he doesn't block the malolactic artificially (he doesn't add sulfites), this is a natural phenomenon. It may have to do in part with the cool cellars, whatever, the whites don't get this secondary fermentation. For his reds he tries to have the malolactic and he has to get the barrels outside in the open chai to kind of boost the secondary fermentation. Sometimes he keeps wine two years and they don't make the malolactic, he suspects it may also be related to the nature of the soil, the terroir. Mikaël discussed the matter with Noëlla Morantin who makes wine just a few kilometers from here on the same side of the Cher river, and her wines always make their malolactic easily, and they found out that the ph of their respective soils is very different, which could explain the difference regarding the malolactic. __ Touraine Côts Hauts 2011 (young vines of Côt). Made from the first parcel we drove to. Vinified in resin vats only, no casks. The nose is nicely powerful with pepper notes and a vinous background. The wines are rather round for young vines of Côt. In the mouth the tannins aren't too astringent. Makaël says that all is destemmed, he makes two foot stompings during the 15-day maceration, he doesn't add CO2 gas or put a lid, he just lets the vat open and the maceration follow its course. On the market since mid 2013, sells for 9 € retail. This cuvée with the Pente de Chavigny are the one he exports, basically. He sold some Couilles D'Anes in California once, through an importer located in Laguna Hills, CA and named Envoyer, but it didn't repeat. __ Touraine Aigues Vives 2010 (Côt). Vineyard on a slope above Faverolles, formerly a Clos (walled parcel), these are young vines (10 years). Elevage in casks. This terroir gives sappy wines, he says. Nose : very aromatic. The mouth is rounder, come probably from the breath of the wine in the barrels. He made the wine with a commercial agent he works with, the man has roots in the region and he wanted to make this type of wine, so he bought barrels and Mikaël brought his grapes, this is a partnership work here. 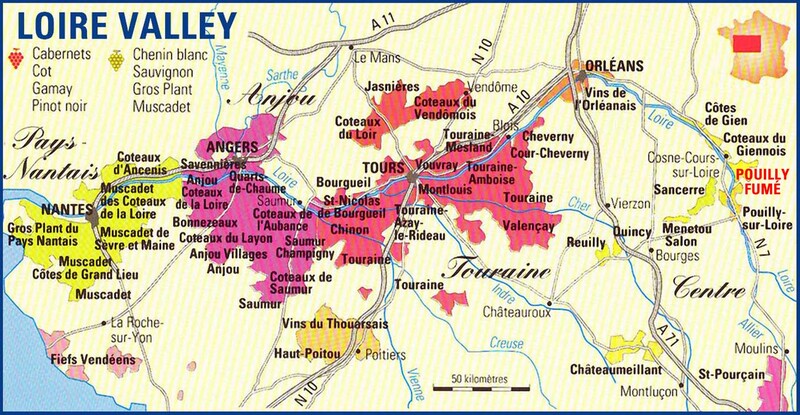 Mikael says that while you find Côt all across Touraine up to its eastern far end (Meusnes and Valençay), the historical area where côt was grown (according to ancient ducuments) is the one of Montrichard, Faverolles, Saint-Julien de Chédon and Chissay. __ La Benjamine 2010, a cuvée of young Chenin (2002) on stony soil with residual sugar (bottled in 50 cl). This was supposed to be a dry wine originally but at harvest time end of semptember the grapes began to rot with the warm, humid evenings and he decided to make a sweet wine. He didn't push the noble rot too far because he wanted to keep a good acidity. The wine fermented during two years and a half, he made 6 casks of it. The nose is fresh indeed. 30 grams of resudual sugar. He sells it cheap (12 €) because it was supposed to be a dry wine and he doesn't want to cheat people as he made the wine unintentionally. He didn't add much sulfites but he made a sterile filtration on this wine. Thewine was bottled this spring (2014) and it is on the market now. Regarding SO2, the only cuvée that saw none of it is the natural sparkling, for the rest he adds a bit before bottling including for the reds because he wants to avoid the oxidative noted related to wines without SO2. He puts something like 20 mg on reds and 30 mg for the whites. For the whites he puts half before the filtration and the rest after. He says it doesn't result in much free sO2 when you open the bottle. Mikaël Bouges sell 50 % of his wines in the Paris region and in Western France, then 30 % for export : mostly the United States (Michael Foulk Wines) and Japan (Diony), then the U.K. (Ten Green Bottles) and Belgium (Le Verre Marais). Mikaël Bouges takes part to a few fairs and tazstibngs, Les Affranchis (Paris), La Levée de la Loire (Paris, Angers). Thank you very much for this excellent report! Thanks a lot for this Great article about Mikael Bouges. He has this great personality that you could find back in his wines. A must try and follow from the new generation of the Loire Valley "Vigneron". My husband and I bought a bottle of La Bavarde. (It is written on a label that looks like an old open book.) Elie & Mikaël Bouges Edition 2000. On the back it says: Merci à Bernadette, Simone, Lucette, Josette, Emmanuele, Gaëlle, Gêrard & Jacky. Can you tell me what kind of wine this is and if it is still good to drink. My husband was killed in 2008 in Iraq and we never got to enjoy the bottle together. I just found it today. Thank you. This cuvée is not easy to find, it seems. This is apparently a Sauvignon (a white from the Loire valley), certainly from a selected terroir with minerality. Must be still good to drink, considering your cellaring conditions were fine (not too hot in summer and better in the dark).